Donuts began simply enough as an idea to turn a particularly good demo beat tape into a full-length release, and has since became a classic hip-hop album, one of the defining works of the artist's life. 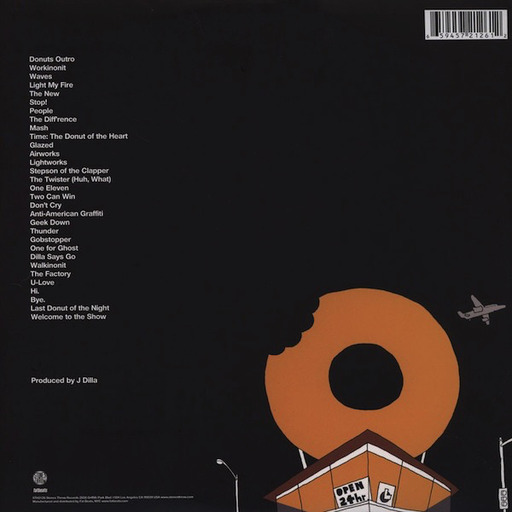 Completed during a year in which J Dilla spent mostly in a hospital bed at Cedars-Sinai Medical Center in Los Angeles, Donuts would gain particular poignancy when, only three days after it's release, February 10, 2006, the artist passed away, losing his battle with a rare blood disease. Announced in Fall 2005, the concept of a “rap album without rappers” struck some as minor novelty, but Donuts would prove to transcend the rigid definitions of what a hip-hop album could be. It plays part like a DJ mix, part like a hip-hop beat maker at work, its songs starting and stopping unexpectedly, like someone turning the dial on an imaginary radio station. But it's an unmistakably modern album, and one which perfectly encapsulated the artist's reputation among his peers and fans as a top-rated architect of soulful hip-hop.